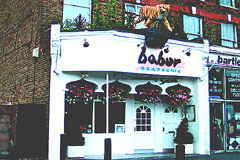 From the outside the full-sized Bengal tiger prowling on the roof tells you the Babur is no ordinary Indian restaurant! Since the brothers Emdad and Enam Rahman started the restaurant in 1985 the Babur has always strived to be innovative and nowhere more so that in its cuisine. The freshest of produce is used to create an ever-increasing and complex array of dishes that have their roots all over the Indian subcontinent. Sunday buffet lunch at £8.95 is extremely popular – and children under 7 eat free.. The success of the Babur has been an evolutionary one. For many years now we have involved our customers in the discovery of both food and wine by holding wine tasting evenings on the one hand and then Food Festivals on the other, where a certain region of India or era of Indian history is researched and the food together with artifacts from that region or period presented. Couple this with customer service in which we take a particular pride and a very distinct and desirable place to be. Open every day from 12-2.30pm and 6-11.30pm. All major credit cards accepted. No service charge. The Babur Brasserie is a stylish and friendly restaurant serving elaborate and interesting dishes which bear no resemblance to run-of-the-mill curry-house fare.